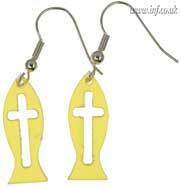 Small acrylic or pewter fish with a cross cut-out. Pendant size 9mm by 23mm. Packaged in short hanging card. Within the range there is also a polished pewter version.